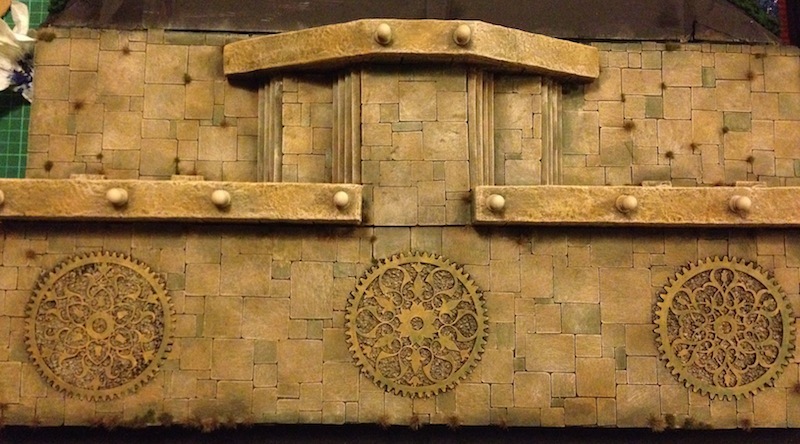 Not long now until PAX – I added some more colour to the stonework last night, using thin washes of green (olive and blue-green) paint. I think it’s really helped to add depth to the stone, removing some of the artificial highlighting that a two-tone drybrush leaves on the model. I managed to find a couple of tubes of acrylic paint hiding at the back of a drawer, and have been able to start work on the stone areas. Still a long way to go here: I’m not really happy with how much the black undercoat shows through, and it’s still a bit too monochrome. I think I need some orange-brown and green washes (stains from rusty water, lichens and moss) to soften it a bit. I put the first layer of texture medium over the water area last night, and am looking forward to seeing what happens to it as it dries out. Hopefully it will result in a shiny surface (reflections are always good on water terrain), and some kind of uneven ripples. I suspect I’ll need at least two coats just to reduce the very obvious brushstroke direction that you can see at the moment. I’ve been using Spakfilla for the mortar – it’s a lightweight pre-mixed joint compound that’s very easy to work with, and much less mess than mixing your own. 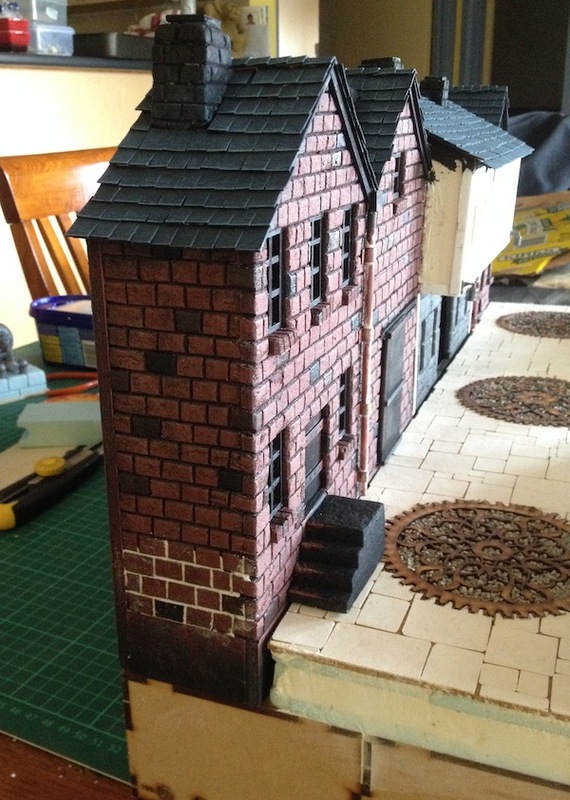 I’ve been working it into the bricks, then scraping off the excess and wiping the whole surface down with a damp cloth. I like the way it ages the bricks by staying in all the little rough patches of texture, but in daylight it turned out to be a bit too stark and white. Fortunately it takes washes just fine, so I’ve used a few shades of watered down brown paint to weather the finished surface a bit. You can see some more of the final effect in the third photo below. I got stuck in to things last night, after picking up some more pre-mixed plaster filler at lunchtime. 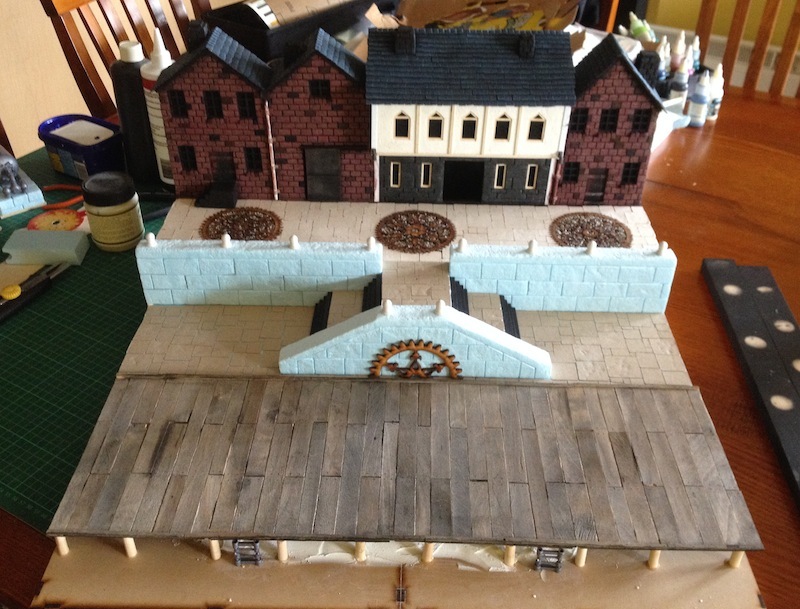 Ended up getting quite a bit done – I really want to get the foundation for the docks painted, as I’ll need plenty of drying time for all of the water effects I want to paint on. 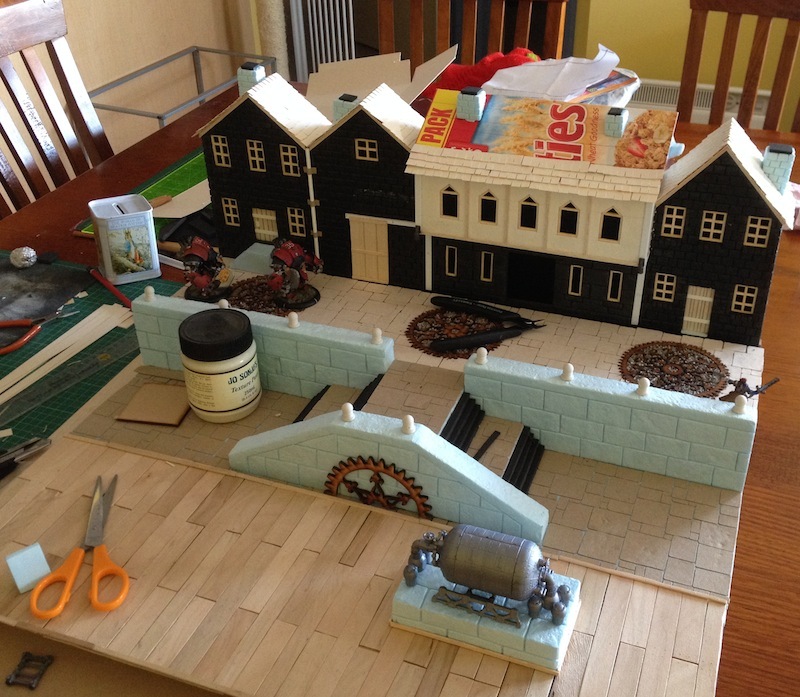 Lots of little details to go, and I have to figure out how to build and paint the dock (probably several stages of each, as it will need to be part painted, then part assembled, then more painting, then final assembly…). I’m pretty happy with how it’s going at the moment, though. 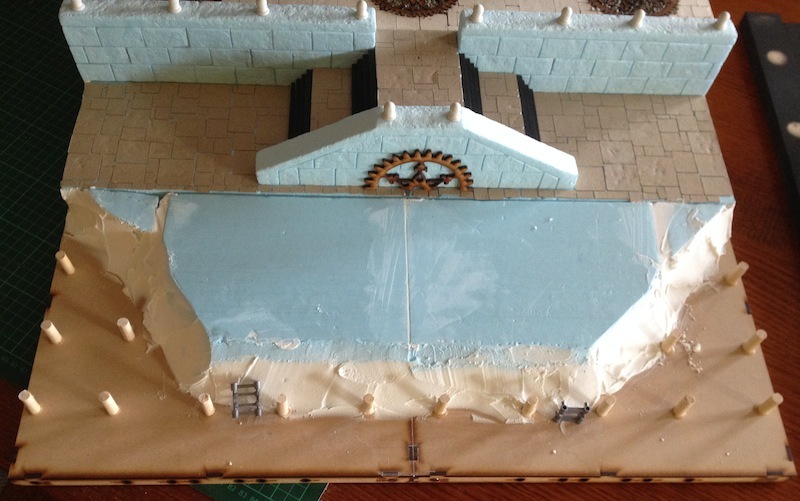 It’s not obvious from this photo, but I’ve used some texture paste to plaster the walls of the upper level of the inn. 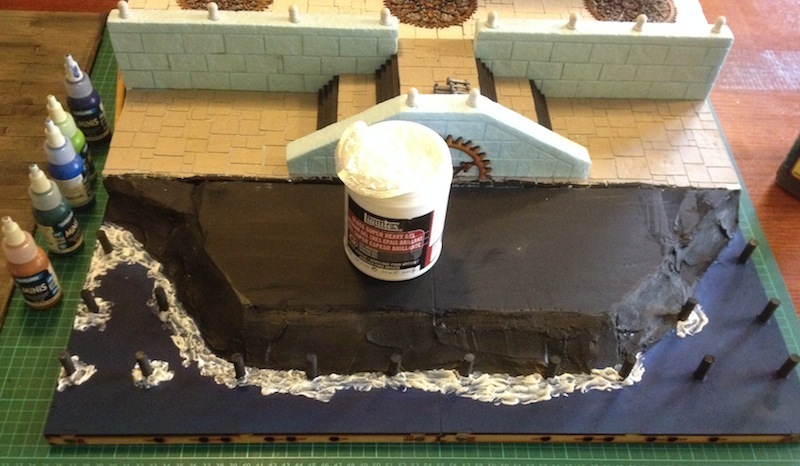 I thought I had some premixed wall plaster somewhere, but may have donated it to the scenery bucket at Games Lab… luckily I found half a tub of Jo Sonja’s paste while I was turning the house upside down looking through boxes, so I managed to get the base of the building finished. 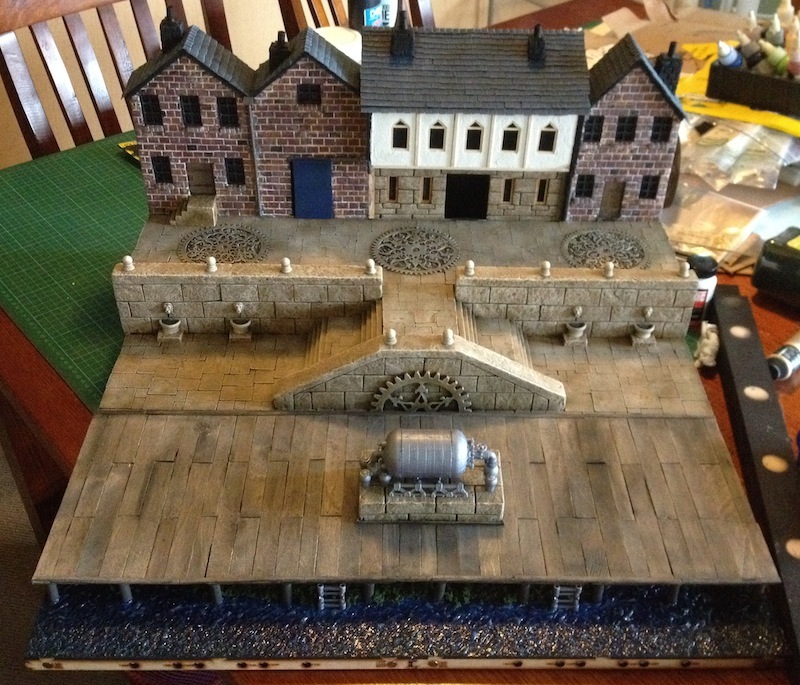 Roof tiles and chimneys are next, but I won’t get to work on it until Friday evening. Hopefully I’ll be ready to start painting on the weekend. 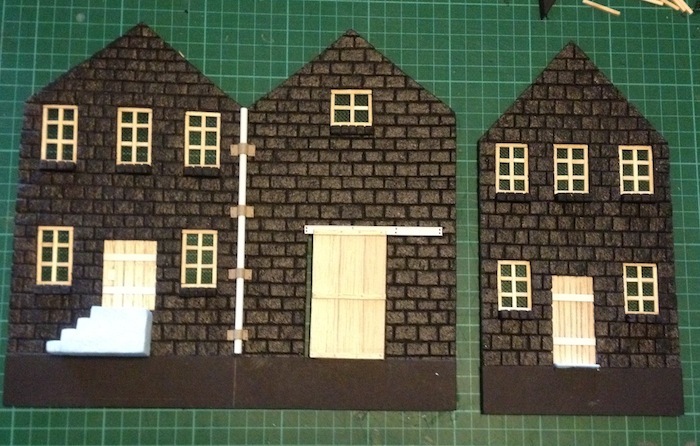 And some street views – I’ve now attached the other buildings to the backing board, and just need to build the roof sections. It’s getting there! 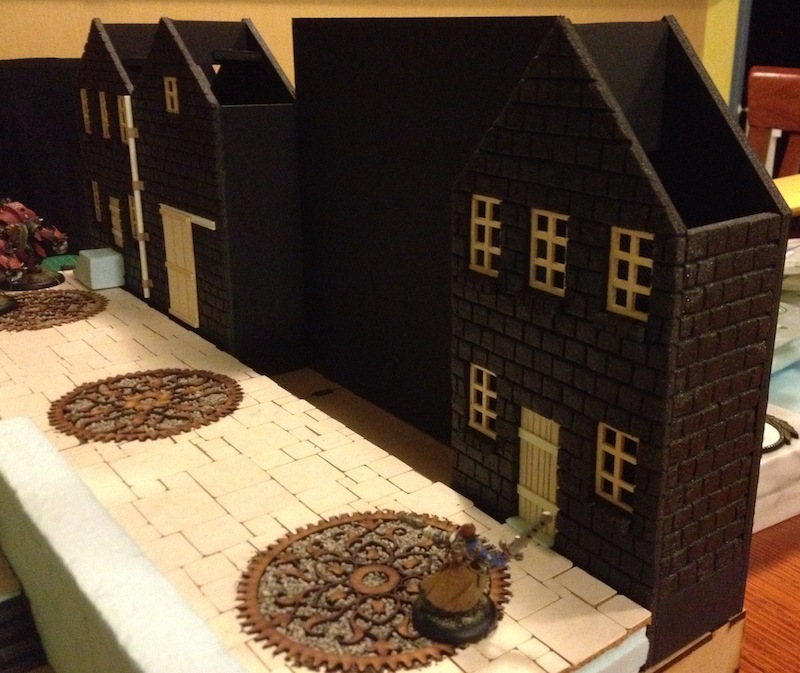 Really need to finish building everything this week though, so I can start painting it all. Hmmm. 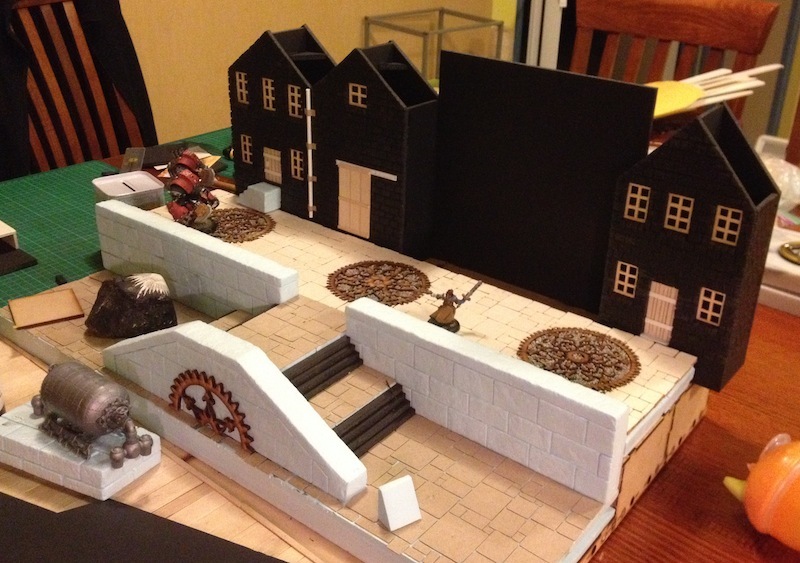 After finally figuring out how to make one type of building, apparently I need to try something different again for the final one… one late-night planning and sketching session later, and things are looking a bit more complicated for the tavern. 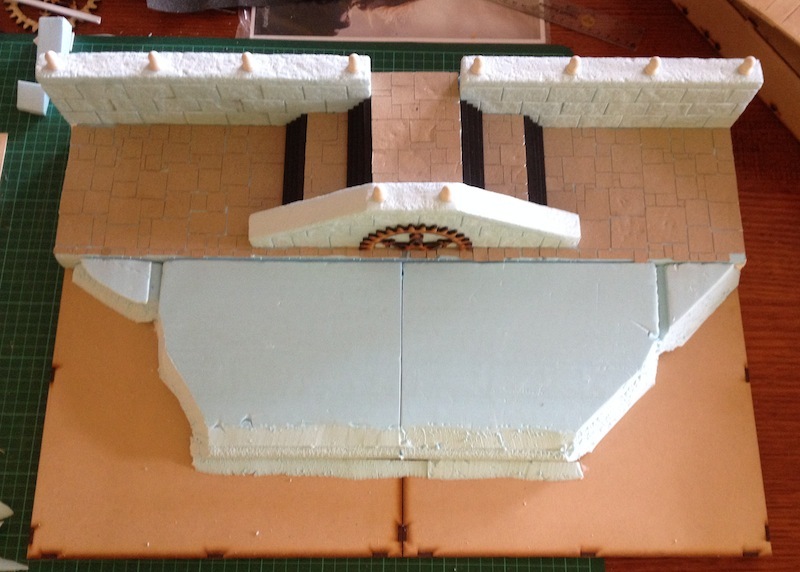 The plan so far is for a ground floor done in large stone slabs, and an overhanging second floor with five windows for small upstairs rooms. 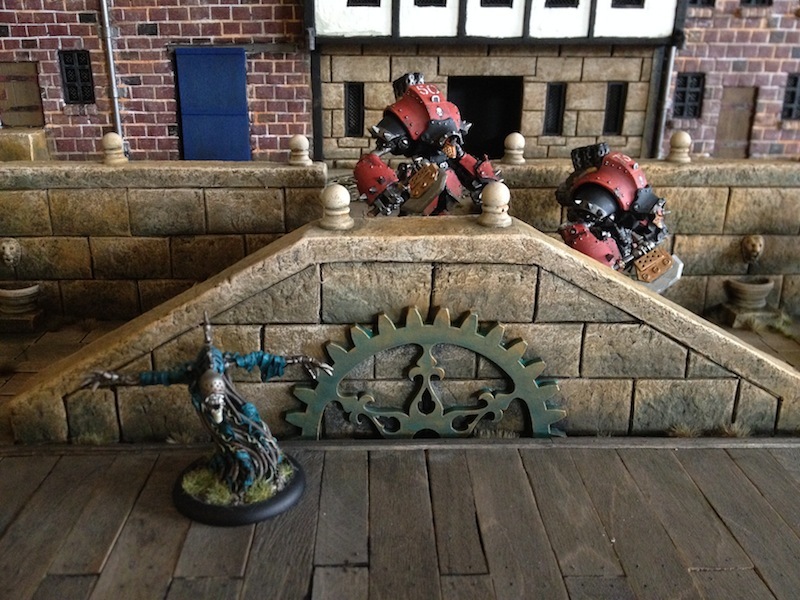 It will use a combination of the whitewash/timber Tudor-ish fantasy building design (cliche, but I’ve never actually built one before) mashed up with some Iron Kingdoms design elements like steel reinforcing bars and rivets. The roof for this one will slope down towards the street, and I might add some attic windows if I can figure out how to build the things. 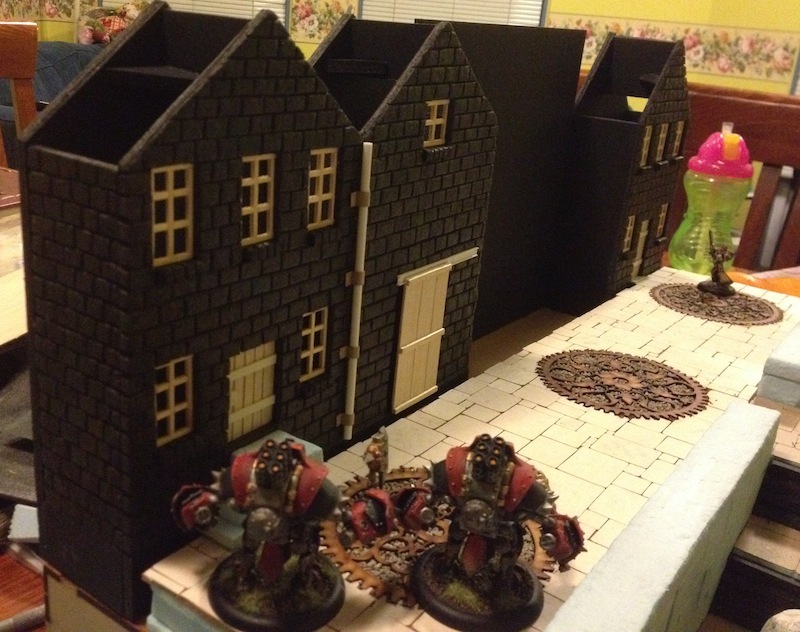 Then I need to get the building row ready for painting. Only 18 days left until PAX AUS! It’s looking a little bit more like a building now. 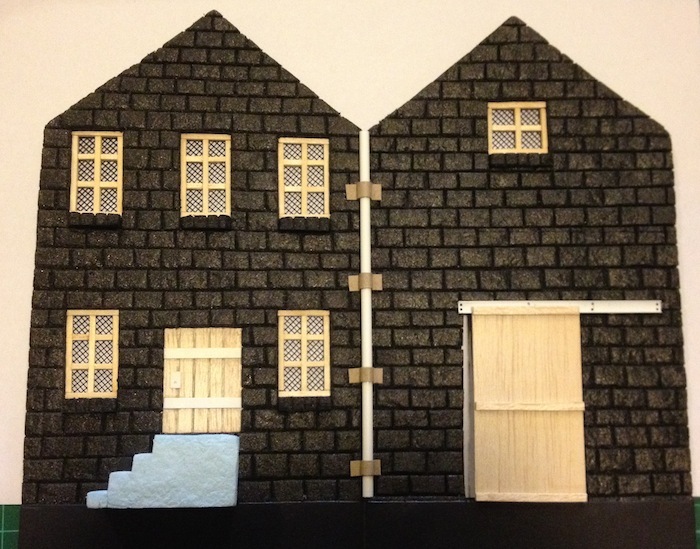 I’ve added some doors (doorknob still needed on the smaller one, though yes, I have carved out a keyhole…) and a downpipe that will eventually be connected to the roof. You can also see more detail on the windows. The flyscreen mesh has attached well: I used a bead of PVA glue around the window frame, and then tacked it in place using drops of superglue to stop the mesh from curling up. 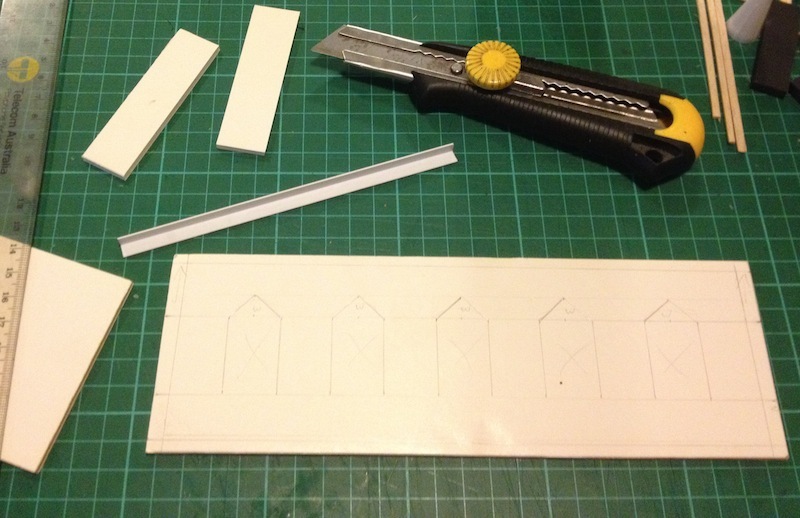 Once it was all in place, I also added some superglue to all the window frame joints. 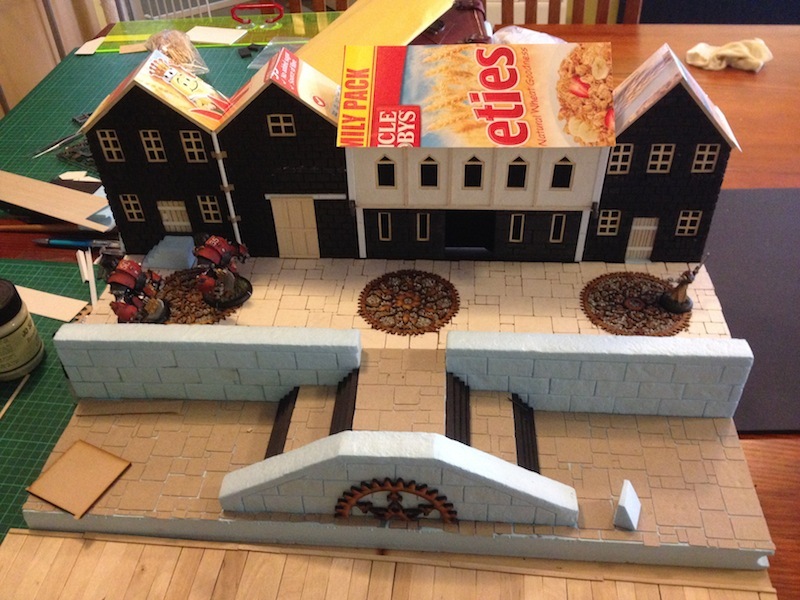 I’m running out of bits to add to the front of the buildings now, and now have to figure out whether I try painting it in bits, or start gluing it all together. 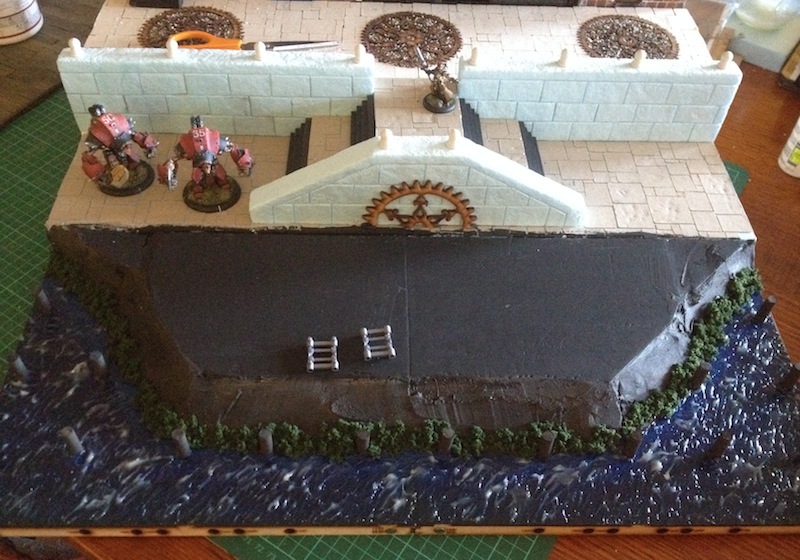 Both have their problems: painting in sections will make it tricky to match colours on different parts, whereas gluing it all together will make it a bit harder to paint. Currently leaning towards the “screw it, just assemble the whole thing first” plan. 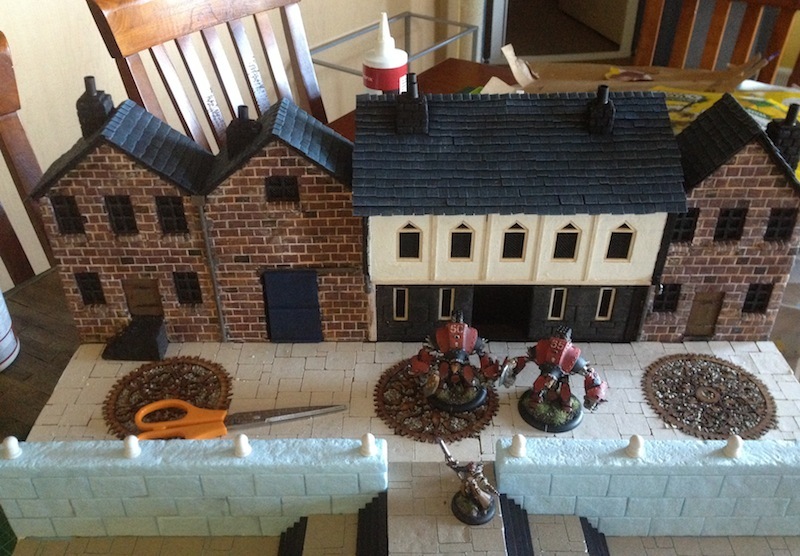 It can’t be much trickier to paint than the 6mm Epic figures I’ve been working on, and I’d really like to see the whole street front done. 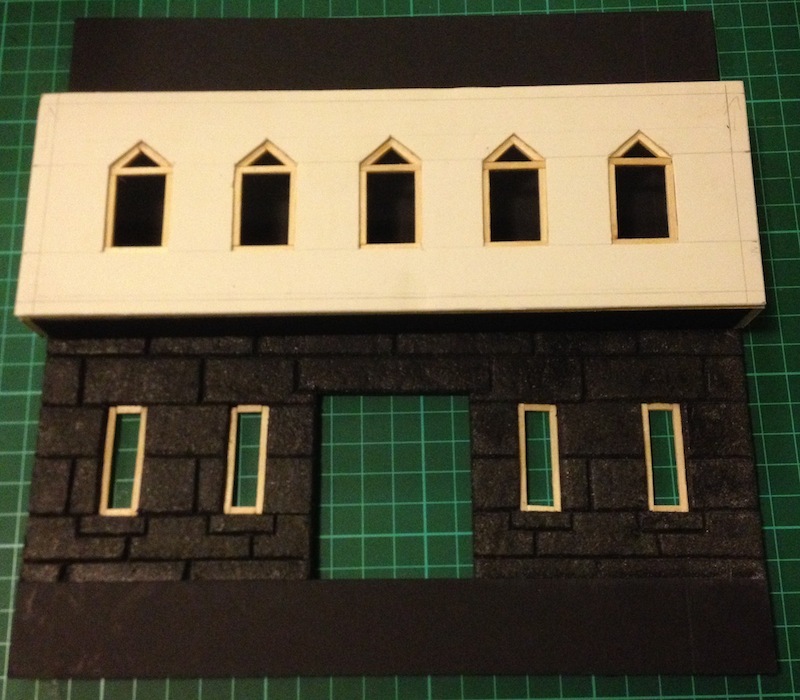 Plus, now that I’ve taken off some of the backing paper the whole facade has started to warp a bit – so I think it’s time to start gluing it on to other sections.